Over thousands of years there has been a co-evolution of bowed instruments, bows, music and bowing skills with each constantly influencing the other. In the course of this co-evolution two outstanding bow types have emerged, the baroque and the modern and they are the stars of this story. 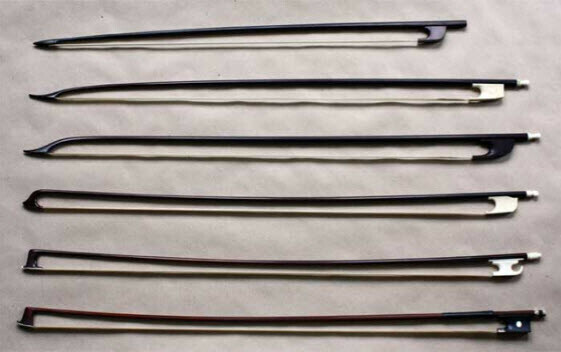 The picture shows six bows progressing from a short, sharp tipped and out curved baroque bow down to the compact, in curved, hatchet tipped modern bow. In between them is a swan billed almost straight bow. The main differences between the two types of bow stick lie in their being in or out curved and their length, weight, taper and type of wood used. The first factors are a matter of how the bow is carved or bent and they have straight forward outcomes. The type of wood used is the biggest issue. Here pure luck produced a major bow mutation. For hundreds of years a highly esteemed purple red dye was derived from wood imported from Asia. It was called brazilwood possibly because its colour resembled glowing embers, “braise” in French. The tree is officially caesalpinia sappan, a bean family member like the grand poinciana, leopard and black bean trees. Apart from its main use for dyes brazilwood was tried and used for bows but it was eventually replaced by the Amazonian snakewood, brosimum guianense, after South America was colonized around 1500. This was the preferred wood since it was better able to satisfy the tonal and dynamic demands which the baroque period, with its resonant church and aristocratic spaces, made on it. Meanwhile a tree similar to the Asian red dye producing tree had been discovered in Brazil. This is called caesalpinia echinata and is colloquially known as pernambuco or brazilwood. A major wood exporting industry was set up and as a result the next few hundred years saw millions of tons of pernambuco being squandered on Europe’s craving for red dye as well as forming the basis of a colony’s economy and giving a country, Brazil, and maybe a state, Pernambuco, their names. However not much else was done with the pernambuco. Its time had not yet come. Eventually, round 1800, the time was ripe for the real genius of pernambuco to emerge. Society and music had evolved, a rising middle class began to fill big concert halls having poor acoustics and more powerful unruly and individualistic sounds were demanded from string instruments. It was then that Francois Tourte, a Parisian bow maker given to rummaging through wharf side timber yards, discovered that the heart wood of pernambuco made unrivalled bows capable of meeting the new demands. The key property of pernambuco is its very low damping factor, bettered only by ebony among the hardwoods. Energy given to the wood is stored as stress energy and is not quickly turned into heat energy. The outcome of this is that a pernambuco bow generates a more ringing and colourful tone than a lesser bow. It is thought this comes about as follows. The stick slip cycle of the bow hair results in the tip of the bow being vibrated at the played note’s frequency which results in the bow stick vibrating. The bow stick has its own resonant frequencies and if any of these coincide with the forcing from the stick slip cycle large vibrations result. These are imposed on the stick slip cycle and vary it thereby colouring the tone produced. Since the properties of a piece of wood vary throughout the bow maker has to shape a stick in harmony with these variations, following an absolutely fixed taper won’t work. The timber’s full acoustic and aesthetic potential must be realized while closely approaching the length and weight constraints of a standard modern bow, 75 cm. and 60 g. and this takes great skill and artistry. Unfortunately skill and artistry and an expensive material result in costly collectors’ items. In the past long searching through tons of timber was needed to find wood without splits, worm holes, knots, low density and other defects and this made the bows expensive. Nowadays bow grade pernambuco is even more precious because forest grown trees have become rare and endangered and plantation trees don’t have the right properties. One contemporary bow maker artist recalls that in fine tuning a bow stick he uses thumb sized planes to shave off the very finest wood curls and that his young children used to call these “angel hair”. A touching sentiment and a tribute to a wild and beautiful tree that was first crushed for dye and then venerated for music. It is now being promoted as a canopy tree for sheltering the cocoa trees that produce our chocolate. In baroque music the bow is relatively subordinate but after the Paganini phenomenon it often gets to dominate as our selections will show. First we have a performance by Petra of the gigue from Bach’s third solo violin partita played with a baroque bow on a baroque violin. The playing style is reserved and mellowness and clear but rounded articulation and are evident. The recording room has most likely a bright resonant acoustic and the piece seems very sonorous though not much bow or dynamic contrast is used and the bow hold looks very delicate. With its gut strings and lower bridge the power and tonal intensity of the instrument is quite limited and it wouldn’t be suitable for a concert hall. Typically the bow would be made of snakewood, a speckled wood mentioned above. a similar but lesser capability thanks also to its out curving shape. Full use of the bouncing and attacking properties of a modern bow are evident in our next piece where the bow often dominates. Hilary Hahn here plays the transcription of Schubert’s Erlkonig lied made by Paganini’s famous successor Heinrich Ernst. Power strokes at the frog, longer bow strokes, a wide dynamic range and an incessant mesmerizing bouncing seize and hurl one the into a realm beyond the baroque’s. But there’s more to come and our last piece shows the bow finally taking over completely. Patricia Kopatchinskaja here plays cadenzas for Beethoven’s violin concerto as sheer hair raising theatre. Extreme dynamics, full length slashing bow strokes, pure long notes with bow colour instead of vibrato, bouncing bows, razor sharp articulations, raw sounds, grating sounds, full use of the modern violin’s wide bow ribbon at the frog where baroque bow’s narrow yielding hair could not give such a percussive attack, big concert hall suited violent bow movements and much more abound. Here, contrary to the old quip, the bow is not the violin, it’s theatre. documentary “A Arvore da Musica”, The Music Tree. A short excerpt with English subtitles is available here.